In case you can't make our May 10, 2011 recording, we're offering this second live recording as an alternative. The 45 minute presentation will feature the same content as the May 10 recording, however due to the nature of having a different live audience, the Q & A session will be one-of-a-kind! At both the state and local levels, enforcement of wage and hour laws has increased dramatically during the past 18 months. In fact, the federal government has added hundreds of new investigators to focus on FLSA (Fair Labor Standards Act) issues. Alleged misclassification of employees, as well as government enforcement litigation, is widespread throughout today’s modern workforce. 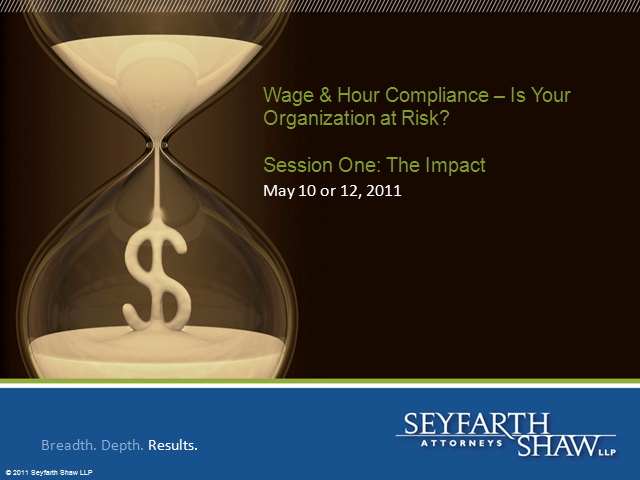 Many uninformed employers will face significant financial exposure and risk if they continue heading down this path. Are you informed on this critical issue? Are your compliance programs state-of-the-art? Join us for part one of the two-part series! Session One - The Impact, will give you an introduction to FLSA, landmark cases, class actions, settlements, cost to employers, and examples of the difficulty in interpreting the law.